Our well casing is produced from Type 1, Grade 1 virgin compound which exceeds the materials requirements for ASTM Standard F-480. This product is specifically manufactured for use in water well construction. IC-2 rated products are tested to withstand higher / more stringent impact standards. SCH 40 Well Casing. Belled End 20ft.SDR 17 Well Casing. Belled End 20ft.SDR 21 Well Casing. Belled End 20ft.SDR 26 Well Casing. Belled End 20ft.Well Casing Specials. Belled End 20ft. Material complies with ANSI / NSF® Standard 14. SCH 40 Well Casing. Belled End 20ft. SDR 17 Well Casing. Belled End 20ft. SDR 21 Well Casing. Belled End 20ft. SDR 26 Well Casing. Belled End 20ft. Well Casing Specials. Belled End 20ft. Basic uses include sewer line from septic to house, down spouts from guttering, foundation drainage, and leach fields. D-2729 Belled End 10 ft.
3" 04.316 3.250 0.070 3.110 46 810 2-hole. 1/2"
4" 04.411 4.215 0.075 4.065 64 500 3-hole. 1/2"
4" 04.416 4.215 0.075 4.065 64 500 2-hole. 5/8"
6" 04.611 6.275 0.100 6.075 128 280 3-hole. 1/2"
D-3034. Belled End 10 ft.
4" 05.416 4.215 0.120 3.965 99 500 2-hole. 5/8"
6" 05.611 6.275 0.180 5.901 220 280 3-hole. 1/2"
D-3034. Belled End 20 ft. 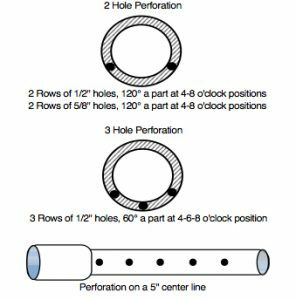 Pipe Drains, Underdrains and French Drains – Perforated pipe shall be placed with the perforations down and the pipe sections shall be joined securely with the appropriate coupling. SCH 40 Reclaimed - Belled End 20 ft.SDR 21 Reclaimed - Belled End 20 ft.
SCH 40 Reclaimed - Belled End 20 ft.
SDR 21 Reclaimed - Belled End 20 ft.
PVC Pressure pipe is primarily used in water service systems. It can be used in residential, commercial, and industrial applications as a water main, to convey water from main to house, or to convey water from well to the house. In addition it can be used in the well to hang the pump or foot valve and for irrigation systems. Warning: Do NOT use PVC piping systems to store or convey compressed air. Doing so may cause the PVC to shatter explosively and unexpectedly, resulting in severe injury and damage. SCH 40 Belled End 20 ft.Schedule 80 GraySDR 21 - Belled End 20 ft.SDR 21 - Gasket Joint 20 ft.SDR 26 - Belled End 20 ft.
SCH 40 Belled End 20 ft.
SDR 21 - Belled End 20 ft.
SDR 21 - Gasket Joint 20 ft.
SDR 26 - Belled End 20 ft.
Silver-Line offers drop pipe in both Sch 80 and Sch 120 (Threaded, Both Ends). These products are traditionally used in Well and Pump applications. All threaded pipe is supplied with a plastic cap on each end to protect the thread until installation. Silver-Line threaded pipe offers ease of installation with a chamfered and beveled end to ease the initial coupling of the threads and allow better tightening. **Maximum Flow Rate is based on a water velocity of 5 ft/s to minimize excessive surge pressures. We recommend that installers of Sch 80 or Sch 120 pipe in well applications should support the pump by using a cable or rope. The length of the coupling used to join PVC threaded pipe should be at least 2 inches. For the use of torque arrestors and centering devices, follow the manufacturer’s recommendations. PVC Conduit is a non-pressure PVC pipe product, traditionally used as an electrical product. Can be installed above or below ground.